It's just two weeks into the new year, and my reading list is already overflowing. As you know, I enjoy books from many genres, but I will always have a soft spot for speculative fiction, especially fantasy. 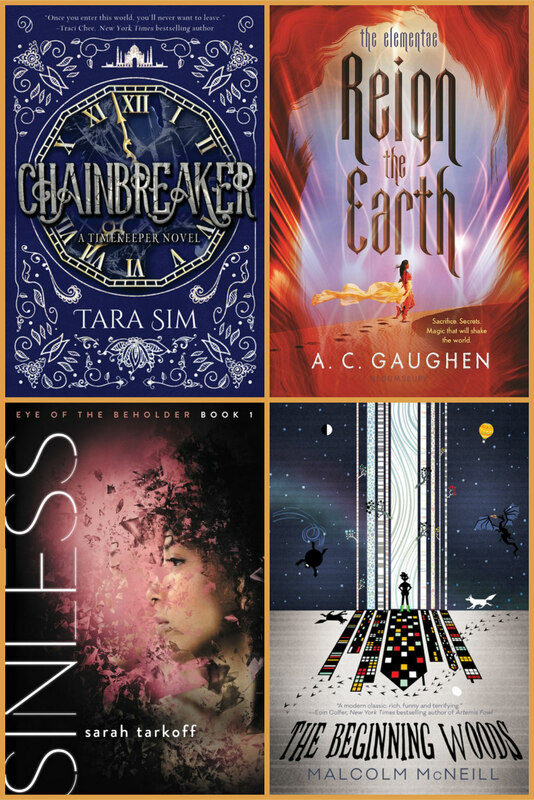 January is bursting with so many great books for those of us who like to venture into different worlds that I had a hard time narrowing down my choices for today's post. 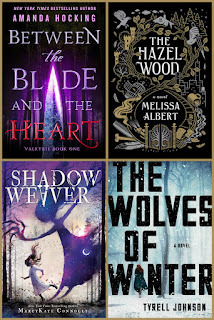 Featured here are the 8 books at the top of my speculative fiction reading list this month. Which titles have you read? Which January releases have I missed? Between the Blade and the Heart by Amanda Hocking (Wednesday Books; Jan 2): I really like Hocking’s writing and am looking forward to this first in a young adult fantasy duology (yay! no long series), especially because it features Valkyries. The plot centers on a conflict between a mother and daughter and promises good action, Norse mythology, and young love. The Hazel Wood by Melissa Albert (Flatiron, Jan 30): You won’t want to miss this young adult contemporary fantasy: It deserves all its prepub hype and starred reviews. The story involves three generations of women, a book of fairy tales with a cult following, and dark magic. This is not your sugar-coated princess kind of tale, but it is bewitching. Shadow Weaver by MarcyKate Connolly (Sourcebooks Jabberwocky, Jan 2): Middle grade readers will love this story about Emmeline, a girl who can control and befriend shadows. When her parents decide to “cure” her of magical abilities, Emmeline is caught up in a dangerous game of survival that tests her and her shadow's friendship and loyalties. The Wolves of Winter by Tyrell Johnson (Scribner, Jan 2): Looking for an adult dystopian that may seem scarily possible? Johnson's novel is about a woman trying to survive in a frozen, post-nuclear world. The story, set in Canada, has been described as having elements of outdoor adventure, thriller, and coming-of-age. Chainbreaker by Tara Sim (Sky Pony Press, Jan 2): This second entry in the steampunk Timekeeper series is set in Victorian (British-occupied) India and stars a gay clock mechanic. Sim’s stories are more than mashups of diversity themes; the fast-paced adventures feature gods, magic, and mythology; clockworks; and time bending, all set on a foundation of facts tweaked into an alternate world. Reign the Earth by A. C. Gaughen (Bloomsbury, Jan 30): A trusted publicist told me about this fantasy in which a young woman agrees to marry the enemy king and suppress her magic in return for the safety of her people. After her brother turns rebel and her powers call to her, she must weigh the costs of taking control of her own future. Sinless by Sarah Tarkoff (Harper Voyager, Jan 9): What if your sinfulness were made manifest for all to see? In Tarkoff’s dystopian world, each wrong act results in physical disfigurement, but who decides what is good and what is evil? Our hero, the preacher’s daughter, begins to notice the gray areas, making her question everything she’s been taught as true and threatening the very fabric of her world. The Beginning Woods by Malcolm McNeill (Sky Pony Press, Jan 9): Although geared to a middle grade audience, this story of a boy found abandoned in bookshop should have wide appeal. Full of magic, dreams, mysterious disappearances, and a quest to a dangerous place, the novel puts a fresh twist on familiar fantasy elements and introduces you to Max, who will win your heart. I can't believe I forgot to put THE LOST PLOT on this list. Arghhhh!! Great looking books! I am so behind on the in books. That's not a genre I gravitate towards but my sister does so I'll share this list with her. I usually don't read this genre, but a friend who is an author wrote a book and I did read it. I actually enjoyed it. I don't usually read this genre, but my nieces do and I will keep this list as a reference for gift buying for them. I am also very in the mood for fantasy these days! The Wolves of Winter is new to me, but with a premise like that I'm off to check it out. It totally sounds like something I'd like. And The Hazel Wood sounds great. oh these are right up my alley .. i just finished the first Invisible Library mash up so thanks for that recco .. i am making note of several of these ..